@ Dorsett Regency Hotel, Kuala Lumpur. Leo Advisor Irene Hoi & Alternate Leo Advisor Jamie Chen accompanied 21 Leos of Monash University on 21 November 2009 on their project - Visitation to Madam Kang Gaik Kee's shelter for over 200 dogs in Kamunting, Taiping. Objectives : Provide appropriate platform for University students to render services to the community and encourage healthy social interaction amongst all participants and Madam Kang Gaik Kee at Kamunting. The ones that were afraid of dogs were selected to clear the outer compound by collecting rubbish whilst the others went in to Madam Kang’s inner compound to clear the dog’s manure, rake leaves and clear the clogged drain. After an hour and half of hard work, Madam Kang invited everyone to eat and collect rambutan fruits that were growing all over her area. Soon, by around 3pm, we said our goodbyes. The Leos made an overnight trip therefore they were able to visit the Night Safari Taiping Zoo and Sungkai Hot Spring the following day. Thanks once again to Lion Josephine’s friend for sponsoring 80kg dog food. Club spent RM120 for this project. for scoring 5A’s for their UPSR exam 2009. 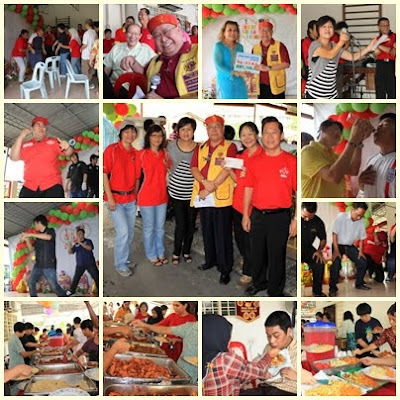 SSMH FAMILY DAY "1 MALAYSIA 1 FAMILY"
The Society for the Severely Mentally Handicapped Selangor & Federal Territory was established in 1984 by a group of parents with severely disabled children who could not gain admission into the special institutions that catered for children with disabilities. The society has its own day-care and training centre and is staffed with 5 full-time teachers, an occupational therapist and a physiotherapist all of whom provide training to equip the children with simple communication and daily living skills in order to give them some measure of independence in their lives. Fifteen children are enrolled for daily training from Monday to Friday. The centre also runs a special Saturday morning session for disabled youths and young adults. There are about 11 young adults attending the Saturday classes where the focus is on communication and activities aimed at helping them become more self-reliant. These activities include making their own drinks and sandwiches, doing household chores like sweeping the floor, and arts and crafts. 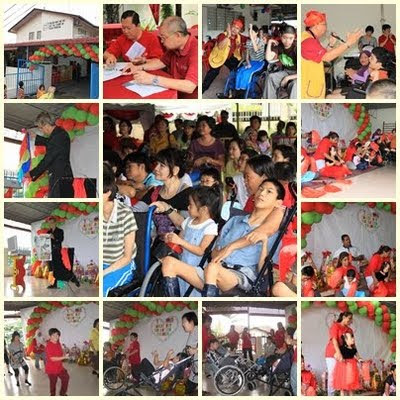 Saturday November 14th 2009, The Society for the Severely Mentally Handicapped, Selangor and Federal Territory (SSMH) today held its annual family day at its Training Centre for Special Children. In line with the national slogan promoted by our Prime Minister, the family day selected “1 Malaysia 1 Family” as its theme. The event was held on its premises located at No 16 Jalan 21/11 in SEA Park, Petaling Jaya attended by President Nelson with members Jamie, Jennifer & Jessie. SSMH President Puan Fadillah Yakin described the annual event as the society’s year-end ‘report card’ where families, volunteers and individuals, and corporations who have lent support to the society during the year come together to experience for themselves what progress the special children under its care have made throughout the year. Also present at the event were representatives of organizations that have contributed to the centre throughout the year. Amongst them were Japanese Women’s Association (JWA), GCH Retail (Malaysia) Sdn Bhd (GIANT), Watson’s Personal Care Stores Sdn Bhd, Mudajaya Corporation Berhad, CIMB Foundation, Glenealy Plantations (Malaya) Berhad, Dato Dr. Wong Sai Hou of Klinik Wong and The Otomotif College (TOC). During the event, guests were treated to various performances by volunteers while teachers, parents and children of the centre also entertained the guests. In the spirit of One Malaysia, these performances were multicultural. 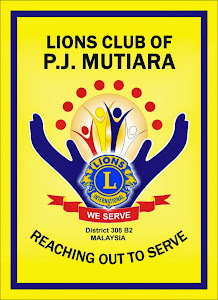 Guests were then entertained to a magic show performed by Mr. Cheah Yoon Weng, a veteran magician and other performances including a Yo-Yo demonstration by the Malaysian Professional Yo-Yo Club members arranged by Lion Jessie, Line Dancing by Fun Stompers and a special performance by the Lions Club of P.J. Metro members. Games were also organized for the special children with each game designed to demonstrate specific movements for the child. In her welcome address, Organising Committee Chairperson Mrs. Evelyn Chan, who is also the Society’s Council Member in charge of coordinating the Parents-Support Group, said that the society is fortunate to have a very active group of parents whose care and concern for the development of their children have made it more meaningful to hold events such as the family day. The event showcases some of the skills the children have been taught at the centre and it is indeed most gratifying to see the progress some of these children have made over the years. Their hope is that parents continue to support the activities of the centre as caring for the special children here requires good cooperation and teamwork between the staff and the parents and other caregivers to ensure that the skills the children learn at the centre are continuously practiced throughout the day.